Every human being is unique and genetically different from others. This is reflected in appearance, special talents, and personality, but also in the genetic predisposition to various diseases, such as tumors or cardiovascular diseases. If you know your genetic risk factors, you can actively contribute to preventing or delaying the onset of a disease or to alleviating its symptoms. Genetic risk factors play an important role in many common diseases, including tumor and cardiovascular diseases. However, a genetic predisposition to a certain disease does not necessarily mean that the disease will develop. Other influential environmental factors – such as lifestyle, nutrition, and exercise – can also influence whether or not a genetic disease will manifest. Intensive early detection programs allow appropriate therapies to be initiated in a timely manner. Early identification of genetic risk factors and timely intervention can prevent or delay the onset or progression of a disease. 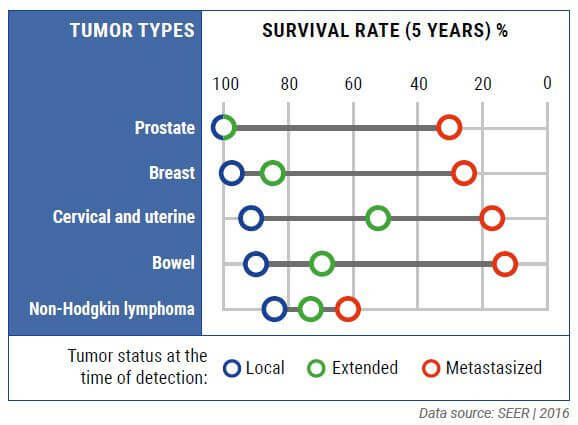 The earlier a tumor disease is detected, the better the prognosis will be. The CeGaT Disease Prevention Panel analyzes whether or not you carry genetic alterations that favor the onset of specific tumor diseases. Identifying these genetic predispositions and initiating regular checkups are important. Not every person processes drugs the same way. What one individual benefits from can either be ineffective or even harmful to others. The CeGaT Disease Prevention Panel analyzes whether active ingredients are broken down particularly fast or very slowly. Based on this information, the physician can select the best medication and administer it in the right dosage. This also applies to future therapies. Disease-causing changes in the genome of individual cells play a decisive role in cancer development. These genetic changes can be triggered by external factors, such as exposure to radiation and smoking. However, disease onset can also be caused by inborn alterations in the genotype, most of which are inherited. In the “tumor disease” module of our Disease Prevention Panel, 35 genes are analyzed that are associated with an increased susceptibility to tumor diseases. For example, we investigate genes that are particularly relevant to digestive tract tumors (various forms of colorectal cancer, stomach cancer, and pancreatic cancer), breast cancer, ovarian cancer, skin cancer, thyroid tumors, and endocrine tumors. If our Disease Prevention Panel reveals an increased risk for a specific type of cancer, then appropriate action will be advised. In the event of disease onset, relevant treatment can be provided in a timely manner. Cardiovascular diseases are the number one cause of death globally. The chance of developing heart disease increases with age, and in addition, certain genetic factors also increase the risk. Disease-causing changes in the genome can functionally disrupt the structure of the heart muscle (e.g., in cardiac myopathies). They can also impair the function of ion channels in the heart, which are important for transmitting electrical signals to the heart muscle. This can cause cardiac arrhythmia. Furthermore, pathogenic genetic changes increase the risk of cardiac death by enlarging vessels, splitting vascular walls, or tearing vessels. Identifying these pathogenic changes will ensure that appropriate measures can be taken. The “cardiovascular disease” module of our Disease Prevention Panel analyzes 69 genes that are involved in cardiovascular function. Pathogenic changes in these genes tell our doctors whether closer monitoring, lifestyle changes, or therapy are necessary. Genetic factors can disrupt blood clotting (coagulation). This can cause blood to clot within a vessel (thrombosis), eventually blocking the vessel entirely and possibly causing stroke. Hereditary forms of thrombosis strongly increase the risk of leg vein thrombosis, stroke, pulmonary embolism, and miscarriage. Abnormal coagulation also causes haemophilia (easy and prolonged bleeding). This is caused by a genetic defect that deletes a blood clotting factor. In haemophilic individuals, blood takes much longer to clot or does not clot at all. This means that even minor injuries or interventions can cause extensive bleeding in joints and tissues, leading to severe blood loss. The “thrombosis and coagulation disorders” module of the CeGaT Disease Prevention Panel analyzes 15 genes associated with coagulation disorders. If genetic risk factors for coagulation disorders are identified, then an attending physician will take appropriate precautions. These hereditary diseases are characterized by the accumulation of iron or copper in the body. Usually, ingested iron and copper are removed by the liver. But in individuals with iron and copper storage disorders, the liver is unable to do this. As a result, iron and copper are steadily absorbed through the intestine instead of being properly excreted. Excessive amounts of iron and copper accumulate in organs and tissues, causing damage and discomfort. Our genetic analysis can reveal a predisposition to iron and copper storage disorders even before the onset of symptoms. In the “iron and copper storage diseases” module of our Disease Prevention Panel, six genes involved in copper and iron metabolism are analyzed. Disease-causing changes in these genes will be identified and appropriate measures will be taken to prevent disease-related damage. Familial hypercholesterolaemia is a hereditary disturbance of lipid metabolism. In 85%–90% of cases, this is caused by a mutation in the low-density lipoprotein (LDL) receptor (docking site for LDL on cells) gene, which increases blood lipid LDL cholesterol by 2–10 times the normal value. This increases the amount of LDL deposited in blood vessels (vascular calcification), which increases the risk of heart attack. Familial hypercholesterolaemia is thought to occur in 1:500 individuals, but only 15 % of cases are actually diagnosed. In young individuals, it is usually only diagnosed after a heart attack. Other diagnostic factors include frequent familial heart attacks, xanthomas (nodular fat deposits in the skin), and strongly elevated LDL cholesterol levels in the blood. In the “hypercholesterolaemia” module of the CeGaT Disease Prevention Panel, five disease-relevant genes are analyzed, including genes that encode the LDL receptor and proteins that affect LDL receptor function. Early diagnosis means LDL cholesterol can be reduced by early interventions and lifestyle changes that reduce vascular deposits, thereby lowering the risk of heart attack. Statins lower blood lipid levels. In our supplementary modules “pharmacogenetics” we can test how effective statin therapy will be (e.g., at lowering the blood cholesterol level). This knowledge allows the attending physician to tailor the drug dose to each individual. Glaucoma (Green Star) is one of the commonest causes of blindness worldwide. Glaucomas often develop with age and without a specific reason. Degeneration of retinal cells during the course of the disease irreversibly damages the visual field. Risk factors for glaucoma include higher inner-eye pressure, ethnic origin, diabetes, chronic eye infections, or cardiovascular diseases. Around 5% of glaucomas are caused by inherited genetic changes that induce disease onset from 35 years of age. In the “glaucoma” module of our Disease Prevention Panel, two genetic risk factors are tested that are known to cause glaucoma. If the tests reveal an elevated risk of glaucoma, then further monitoring is recommended to ensure that appropriate treatments are initiated as soon as they are necessary. The earlier glaucoma is detected, the better the prognosis, and the sooner the appropriate therapy can be initiated to slow down or even stop disease progression. Malignant hyperthermia is characterized by a life-threatening response to anaesthesia. In the presence of certain genetic risk factors, anaesthetics or muscle relaxants disrupt calcium metabolism in the muscle. This disruption causes muscles to cramp and become rigid. As a result, the blood pressure and body temperature are increased. If these symptoms are not treated quickly, the patient will die from metabolic and organ failure. This inherited disease is usually recognized for the first time when anaesthetics or muscle relaxants cause a life-threatening situation. However, a well-tolerated response to anaesthesia does not exclude a predisposition to malignant hyperthermia because patients can undergo an average of three narcoses before disease onset. The “malignant hyperthermia” module of CeGaT’s Disease Prevention Panel tests two genes that are responsible for more than 70% of malignant hyperthermia cases. Diagnosing a predisposition to malignant hyperthermia before a surgical intervention means that the individual can be anaesthetized in a way that will not trigger an unfavorable reaction. Pharmacogenetics illustrates how genetic changes can affect the influence of drugs. Genetic changes in the proteins responsible for absorption, distribution, metabolism, and excretion of drugs can have a huge impact on their effectiveness and compatibility. Some drugs have different effects on different people, e.g., antidepressants, analgesics, neuroleptics, chemotherapeutics, AIDS medication, thrombosis medication, anaesthetics, beta blockers, and statins. Reduced or missing activity of a specific enzyme may increase the drug dosage and cause unwanted side effects. On the other hand, medication that is activated by metabolism may not work if an enzyme is inactive. Enhanced enzyme activity can also affect the response to medication, e.g., by degrading the active ingredients. The “pharmacogenetics” module of our Disease Prevention Panel analyzes known variations in 17 genes that are involved in the metabolism of medicinal products. If gene variants are found, the physician can customize the therapy to avoid serious side effects and treatment failure. The process begins with genetic counseling and advice from a qualified specialist. Then, the specialist and patient complete the application for testing together, and a blood sample is collected. All genes in the Disease Prevention Panel are sequenced by next-generation sequencing at CeGaT. CeGaT’s interdisciplinary team of scientists and physicians analyzes and interprets the sequencing data. The results are summarized in a detailed medical report and sent from CeGaT to a qualified physician. The results are discussed with the qualified physician.